Spring: A Season to be cheerful. Spring heralds the return of my wedding season; a season that properly kicks off in March and which doesn’t stop or slow until December 23rd. I love to look back over previous years and note how early or late the flowers bloomed in my garden as well as arrive in the flower market. This year I see the flowers are blooming later than last by two to three weeks. Spring flowers have a luminosity and vibrancy all of their own. The green of new growth has a certain softness to the touch and a vibrancy on the eye. From the cheerfulness of a yellow of daffodil and forsythia, to carpets of aconite and crocus in the garden, spring colours awaken the senses softened only by clouds of pink and white blossom in the trees and hedgerows. Blue is a colour I particularly associate with April; bluebell swathed woodlands, pretty muscari in my flower beds or forget-me-nots' growing in every conceivable crevice in the garden. I used to think of these tiny blue dots as weeds but have since embraced this tenacious little flower. Even the little seed podded stems at the very end of their season can create texture in an arrangement. There are some flowers which appear timeless, season after season we welcome their return with love and affection such as the aforementioned daffodil, others have grown in popularity. One such newcomer is the hellebore, also known as Lenten Rose they have long been a favourite of mine I particularly admire their bashful downward looking stance. A few years ago they were less widely appreciated as a cut flower and they lent an unusual accent to my bridal bouquets (alas I cannot say the same today)! Once a virtual unknown on the cut flower circuit, unpopular in part due to their unpredictability and tendency to wilt, hidden in shady corners of our gardens, hellebore s often went unnoticed as the ranunculus and other spring "super models" tulips and narcissus took centre stage. They are currently enjoying a moment of glory amongst florist and horticultural circles with many varieties available with a longer vase life, they are also extremely versatile straddling the foliage-flower boundaries such as the green Argutifolius. There are some twenty varieties to choose from and you will find the plants at every garden centre across the land with a variety for every aspect in the garden, a personal favourite is Helleborus Sternii. To use in a bouquet or arrangement - cut and scald the stems in boiling water for 20 seconds before using, alternatively cut when the seed sets later in their season. I particularly enjoy the fleeting availability of a genuinely seasonal flower; I like how I can look back at one of my bridal bouquets and even if I don't recall exactly who I made it for, I will be able to date it by the season just by looking at the flowers I used. The window in which seasonal blooms appear is often dictated by the weather: a cold spell will delay, warmer temperatures augment and speed up. Polygonatum (Solomon Seal) and the Fritillaria family are particular favourites of mine but the tiny flowers of Spiraea Arguta "Bridal Wreath" is my current floral muse. Its’ delicate white blossom on the finest filigree branches adds a slightly incongruous awkwardness to my arrangements; the branches do not bend willingly but remain steadfastly upright if a little contorted; it has an air of frailty I cannot help but admire. This little flower grows in my garden and blossoms around mid-April it has the most fleeting of seasons but I can extend this by buying in from the Dutch flower markets where it is available at least three to four weeks ahead of my own garden offerings. A bridal bouquet from April 2016: when the UK poly tunnel grown sweet peas merge with garden bluebells, forget-me-not and spirea. A professional workshop at Little Park House. Wiring is a skill which has many uses in an event florist’s repertoire. From buttonholes to shower bouquets, the use of wires in floristry is a subtle and discrete technique which can create finesse in the finer details of floral design. Enjoy a day at a beautiful country house where you will perfect and fine tune the key floristry technique of wiring. Using a selection of flowers, many of which will have been grown by Jill in her cutting garden, Lindsey will guide you through the basics before you make your own wired bouquet. Your finished work will then be professionally photographed by Caroline Palmer for use in your own portfolio. 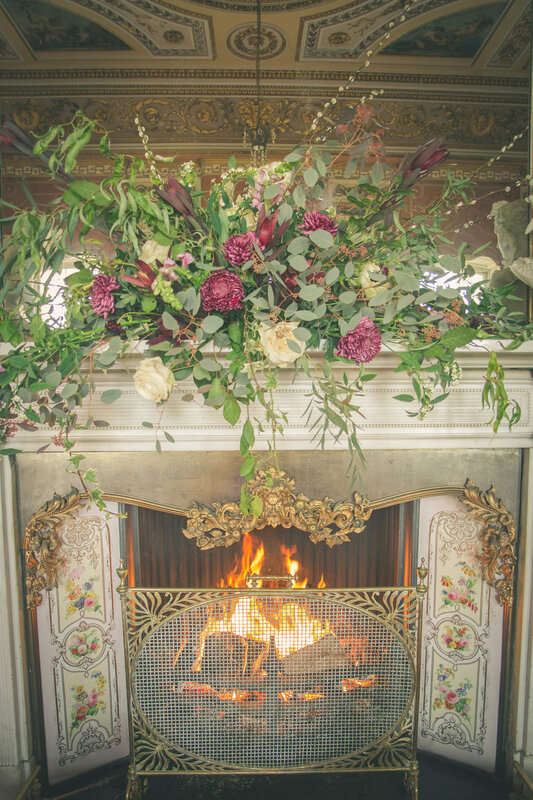 Lindsey Kitchin is an experienced event florist at The White Horse Flower Company. She has been teaching workshops to florists and non-florists for many years. Lindsey uses wired flowers mostly in her wedding work, such as for buttonholes and bouquets. Jill Houston lives at Little Park House and is a flower farmer currently in her second year of growing for retail. Together we are combining a love of cooking, specialist skills and experience with flowers at this beautiful location to host a series of workshops. This workshop is aimed at florists wishing to improve their wiring techniques rather than the flower enthusiast and some basic wiring experience/understanding is required. The class will be intentionally small so that each participant has adequate time and support throughout the day. January can have so many connotations of misery. Resolutions of weight loss of renewed fitness to cast off the excess and under-activity of December. Pay day seems interminable as we eek out what little money there is left after the credit card and invoices are settled. All of this adding to the gloomy mist that descends; a grey, cold and damp mist. In spite of the longest day having been and gone, the daylight hours remain relatively fleeting as we look longingly towards the light, craving more warmth, more colour in our world with the hope of the good times ahead. For me, I spend much of January looking forward whilst at the same time looking back. I look forward to meeting all my new clients – the couples planning their weddings in the year (or two) ahead. I don’t diet in January nor do I deny myself the simple pleasures of a welcome glass of wine with my healthy home cooked January suppers. Why deny simple pleasures during the longest, coldest, bleakest of months? Surely it is much more bearable to withhold a little during March or April? When there is less of a bite in the air, more colours and more of a sense of joy in our surroundings to make a bit of restraint more bearable? This month I have been busy. Busy taking time to look after myself with a minor operation all carefully planned and booked in to coincide with anotherwise quiet month. I am already back to full strength and back on the yoga mat with a headstand this morning (and no wall behind me to hold me up either)! To open the batting for 2017 I have my first wedding this coming weekend - it's full to bursting with colour, spring will arrive early at my studio, I’ll have tulips in all sorts of colours and shapes and I am positively itching to get going. I had such a great 2016, super busy but I had to let some things slip in order to keep pace with the sheer demand and workload of my wedding diary. The blog fell first in July. I’ve missed writing it so much. This year I am resolved to keep all plates spinning in all aspects of what I do and love the most, there will be more “sharing of the floral love” by that I mean more teaching of workshops. This year I’m planning to teach both florists as well as non-florist flower enthusiasts. I’m looking forward to running several workshops at Little Park House, home to Little Park Flowers and owned by the lovely Jill Houston, now embarking on her second year of being a flower farmer. I am enjoying watching her journey unfold as much as enjoying the flowers she grows; so grateful our paths crossed last year, I think we have a lot to offer collectively with the workshops at her beautiful home using her beautiful flowers. So here’s a few images from 2016. Most are my own pictures taken as I work but there are one or two (you will be able to tell) that are by the professionals namely Guy Collier and Mia Photography. I will share more pictures as I meander through the year ahead, dipping into 2016 and enhancing my musings with those from 2017, punctuating the months with my thoughts on this and that by way of my blog. It’s good to be back in the driving seat and behind the wheel - I'm ready to go. Hostess Belinda Chaffer cordially invites you to a Wreath Workshop at Beenham Grange Bucklebury, Berkshire. This workshop will be taught using a traditional moss based wreath you will learninghow to cover the moss base in foliages and decaorate it. Little Park House, Brimpton, Berkshire £65 per person to book please click the link: https://littleparkflowers.jezzam.com/. There are wreath workshops and then there are The White Horse Flower Company Wreath Workshops. we've been running wreath workshops for well over a decade and in that time they have become hugely popular. Participants return year after year (after year), bringing with them friends and family to kick off Christmas. Fun, laughter and creativity are guaranteed! Passionate about the quality of my ingredients and decorations, you will create something I hope you'll be really proud of not to mention the envy of your neighbourhood! Completely unique and not identical to the wreath made by the person standing next to you in class, TWHFCo. wreaths are luxurious and decadent, they can be traditional or contemprary - whatever you want them to be. The White Horse Flower Company classes more often than not have a charity element to them as this is my way of giving something back at Christmas time all the while sharing my passion for floral design. Dont just take my word for this, both The Daily Telegraph and The Newbury Weekly News have sent reporters and photographers over the years to see what all the fuss is about and given us some fab reviews! All classes are based on a similar format: Lindsey will demonstrate how to make a door wreath before you create your own unique design using fresh foliage alongside lots of seasonal decorations. All materials will be provided and Lindsey will be available with advice and hands on help throughout the sessions wherever you choose to enrol. The first four workshops are taught using foam pastic backed wreath bases, the last tow at Little Park willbe using the more traditional moss based wreath.